From Italy to Tanzania to Mexico, no matter if they are garnish in a salad or the base of a sauce, tomatoes are a food staple the world over. Unfortunately an invasive tomato pest known as the South American tomato leafminer, has become just as prolific as the tomato crops themselves. The pest, whose scientific name is Tuta absoluta, is a particularly terrible threat. It globetrotted from its native Latin America to Europe in 2006 and later crossed the Mediterranean to Africa. Now threatening Asia, the moth strikes small-holder farmers around the world, leaving a destructive path in its wake. But Virginia Tech researcher Muni Muniappan is working to quell the effects of the pest. Muniappan noticed Tuta’s arrival in Africa in 2012 and subsequently led several workshops in Senegal, Ethiopia, Nepal, Bangladesh, Kenya, and Tanzania to raise awareness of the pest and give tips on controlling its prolific destruction. Muniappan recently convened a group of plant protection specialists in 2015 to develop strategies to control the moth at the 18th International Plant Protection Congress in Berlin, Germany. Some control measures include quarantining the plant and not importing tomatoes with stems, leaves, or a calyx, the green sepals of a flower that form the outer floral envelope, and using pheromone traps in border areas, and also developing a roster of Tuta’s natural enemies that could be used as biocontrol. World production of tomato is approximately 163 million tons annually, and production of the crop covers 10 million acres worldwide, Muniappan says. In the United States, the tomato industry accounts for more than $2 billion in annual farm cash receipts, according to the USDA. The economic impact of this insect has already been severe in countries where it has become established. In Spain, its presence led to an increase of $209 per acre per season related to pest management. In central Argentina, management of Tuta accounts for 70 percent of the pest management costs for late-season tomato crops. The Center for Infrastructure-based Safety Systems at the Virginia Tech Transportation Institute is partnering with the Virginia Tech community to host the annual Next Generation Luminaires design competition, March 22-24, 2016. The competition is meant to encourage the innovative creation of energy-efficient LED luminaires for commercial, industrial, and institutional applications. 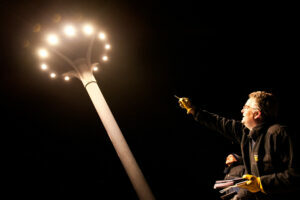 This year, parking garage luminaires will be judged in the Kent Square Parking Garage, and sports lighting luminaires will be judged on Thompson Field. Other categories—including parking lot luminaires and pedestrian-scale luminaires—will be judged along the Smart Road and the surrounding campus of the Virginia Tech Transportation Institute. The Next Generation Luminaires competition is organized by the U.S. Department of Energy, along with the Illuminating Engineering Society of North America and the International Association of Lighting Designers. The luminaires will be judged by a diverse panel of experts on criteria such as color quality, appropriate illuminance, light distribution, and appearance and style. The judges will observe the lights in their natural setting during the evening and further evaluate them unmounted during the day. While the events are not open to the public, winners of the competition will be announced in April 2016 at LIGHTFAIR International. For more information about the competition, please visit http://www.ngldc.org. It’s late January in central Namibia, the time of year when heavy rain showers become a regular source of relief for many animals. If the rains arrive, a green carpet spreads across the landscape and food becomes plentiful for all, providing the necessary resources for many species to reproduce. If the rains fail to show, dehydration and starvation sweep through the land like a plague. All individuals suffer, but the young and old, the weakest and most vulnerable, become the most common victims to drought. During these times, pining parents will often fail to rear offspring and may forego breeding altogether, forced instead to focus entirely on survival. I’m outside Otjiwarongo, studying the local cavity-nesting guild, a specialized and highly diverse community of animals that use tree cavities for nest sites. Found in forests worldwide, cavity-nesting guilds are composed of mammals, reptiles, amphibians, invertebrates, and, my favorite, birds. I will call this area home from December through May over the next few years as I attempt to understand the structure of this particular cavity-nesting guild. Do certain species prefer certain types of cavities? How do species interact with each other while competing for cavities? How might human management impact these communities, and how can we ensure that our actions don’t jeopardize their persistence? Hopefully I can strike it rich and obtain crucial insight into these questions. But before I can strike gold, I must first strike water. Dams have been empty for months, parched from a drought the previous year, and withered carcasses become more and more common sites in the field. Everything is looking to the sky for rain, myself included. If I’m to have any success in my research, I need the rains to come and help kick start the breeding season. On this afternoon, it seems prayers have been answered. Two hours after gray clouds first crept into view, the sky is a dark, bulging waterbed waiting to burst. Before you can grab your raincoat, the monsoon begins. Downpouring, deluging, raining cats and dogs; throw out your best idioms, just run for cover as you do. The storm doesn’t last long, thirty minutes at most, but that’s plenty of time for two inches of rain to fall. Rivers form wherever they please, Oryx splash about like children at a water park, and hope is seemingly restored to the land. In the days following the rain, the landscape is vastly transformed. The previously barren earth sprouts a green mane, while acacia trees finally look more leafy than thorny. Animals have also responded. Roadside puddles are filled with enormous African bullfrogs, Leopard tortoises race across roads with re-energized vigor, and the hordes of antelope, once concentrated in mass at man-made water holes, are nowhere to be found, having dispersed to newly formed pools throughout the landscape. The birds are lively as well. Prospective passerines gather grasses to build nests within barbed branches. A second visit to our nest boxes reveals that almost a dozen new female hornbills, the largest cavity-nesters here in Namibia, have begun to build. Things are looking up. But it’s still too early to say if the weather will be fruitful. One heavy rain is far from adequate for the animals here, which are accustomed to and hoping for regular downpours from December through April. If only they knew the weather projections. A strong ENSO (El Niño Southern Oscillation), as is predicted for 2016, usually correlates with even drier weather in southern Africa. So while California finally climbs out of a drought, Namibia may be set to plunge deeper into its own. To make matters worse, climate change models predict increasing aridification of Namibia over the coming century. This means less annual rainfall, and more frequent and severe droughts. The current circumstance may severely hamper my own research, but these projections intensify the overall need for research on cavity-nesting guilds. How will species respond to more frequent droughts? How will less rainfall impact tree growth and cavity availability? How will these changes alter the interactions between species? If there is to be any hope of preserving these communities, it is vital that we understand their structure so that efforts can be made to maintain them. Chickens are unlikely harbingers of the invention of time travel, but a recent study using a line of White Plymouth Rock foul developed in Virginia Tech’s College of Agriculture and Life Sciences caused evolutionary history to speed up a bit. Specifically, the experiment proved that evolution happens 15 times faster than previously thought. The research was published recently in Biology Letters, a journal of Royal Society Publishing. The discovery involved researchers from several universities, including the University of York, Oxford University, the University of Sydney, Uppsala University, the Swedish University of Agricultural Sciences, and Virginia Tech. Siegel’s other primary research area using genetic lines of chickens focuses on why some animals pack on pounds and others don’t, and will be a key component of finding out how to breed chickens to feed the projected 9 billion people set to besiege the planet in 2050. Siegel, along with Ben Dorshorst and Christa Honaker, also in the Virginia Tech Department of Animal and Poultry Sciences, were co-authors on the current paper. The pedigree lines of White Plymouth Rock chickens were developed by Siegel, who began breeding them in 1957. From the common founder population, he produced two distinct lines of chickens selected for high- and low-body weight. Today, the high-weight line dwarfs its low-growth counterpart by an average of 12 times more by the time they reach the eight-week selection age. In the latest experiment, researchers analyzed blood samples of chickens of the same generation using the most distantly related maternal lines to reconstruct how the mitochondrial DNA passed from mothers to daughters. Mitochondria are specialized structures in the cells of animals, plants, and fungi that generate energy, synthesize proteins, and package proteins for transport to different parts of the cell and beyond. The sampling scheme yielded 385 mitochondrial transmissions that were analyzed for linkages within the mitochondrial DNA. The rate of evolution was calculated by analyzing the number of observed mutations in the approximately 16,000 samples of mitochondrial DNA in the genome over 47 generations. The scientists then reconstructed the maternal pedigree based on the mitogenome sequences. The experiment also determined that mitochondria are not solely passed down from maternal lines. Strictly maternal inheritance has long been thought of as the characteristic of mitochondrial genomes. “The thing everyone knew about mitochondria is that it is almost exclusively passed down the maternal line, but we identified chicks who inherited their mitochondria from their father,” said Michelle Alexander, lead author. This finding supports the theory that “paternal leakage” is not such a rare phenomenon.